No Sonadow for Shadow >:3. 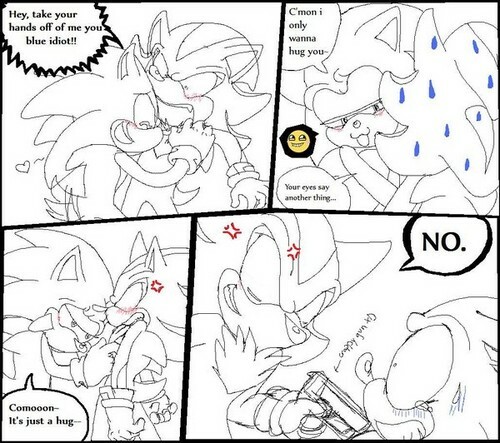 Hehe no sonadow for Shadow >:3 . Wallpaper and background images in the Shadow The Hedgehog club tagged: shadow hedgehog sonic. wait you don't like Sonadow? @Shadowsister Ya know,I posted a picture of Shadow killing Sonic because he hates Sonadow. But I actually love Sonadow. by the way-teh gun does not look crappy. compared to what i draw it looks like a famous artist drew it. in short-IT LOOKS EPIC. @SHADOWSISTER:OH REALLY,HUH????? IT'S GOING TO BE THIS WAY!!!!!!!!!!!!!!!! Juliet@ Calm down! Do you even understand what he is saying Or she! Omg he/she is saying that you're right that sonic loves amy o.o You better learn more english... (Just saying) And dont shout at people.Thats mean . Okay? My opinion is the same as Shadow's. NO.